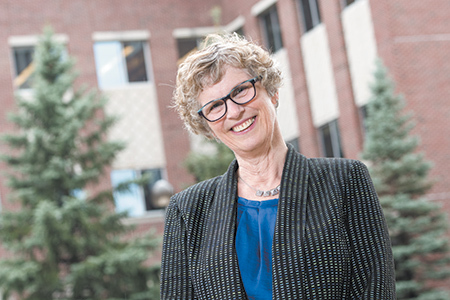 Dr. Joan Duwve, associate dean for practice and clinical associate professor of the Indiana University Richard M. Fairbanks School of Public Health – Indianapolis was recently honored as a Woman of Influence in the Indianapolis Business Journal. Spotlighting some of Indiana’s most successful business women from both the public and private sectors, the 2017 Women of Influence program recognizes women who have demonstrated professional excellence and leadership in their careers and community service. Dr. Duwve is one of 22 women honored and featured in the 2017 Women of influence publication of the Indianapolis Business Journal (IBJ). As a result of her work, adolescent immunization rates from 2009 to 2011 in Indiana increased from 40th in the country to first, and more recently, opioid prescribing decreased 16 percent in Indiana. Although Dr. Duwve explained to IBJ that it was a complex, team effort, much of the credit goes to her. Upon completing her bachelor’s in international studies from Ohio State University, Dr. Duwve joined the Peace Corps. She was stationed in Morrocco where she learned firsthand the importance of public health issues. Her Peace Corps experience led her to become a champion for public health, and instrumental in collaborative responses to the H1N1, fungal meningitis, Ebola and HIV outbreaks. Returning to the states, Dr. Duwve earned a master’s in public health in population planning and international health from the University of Michigan. She became grants officer for North Africa/Middle East and Francophone Africa projects at Engender Health, and was key in funding family planning projects. Unfortunately, she often found herself patronized while working in North Africa for not being a physician and thought, “I can fix that,” she told IBJ. Dr. Duwve decided to earn her medical degree from Johns Hopkins University School of Medicine, and then entered the Family Medicine Residency Program at St. Vincent Hospital in Indiana. She served as a family medicine physician in rural Madison County and suburban Hamilton County before becoming medical director at the Indiana State Department of Health. Promoted to chief medical officer, she co-chairs the Indiana Prescription Drug Abuse Prevention Task Force and serves as associate dean for practice at the Fairbanks School of Public Health. Currently serving on the board of Covering Kids and Families, Dr. Duwve is a founding board member of the Midwest Injury Prevention Alliance, a member on the Board of Scientific Counselors for the Centers for Disease Control and Prevention’s National Center for Injury Prevention and Control, a Girl Scout leader and softball coach. She has also been a volunteer musician with the Indiana University School of Medicine student orchestra.